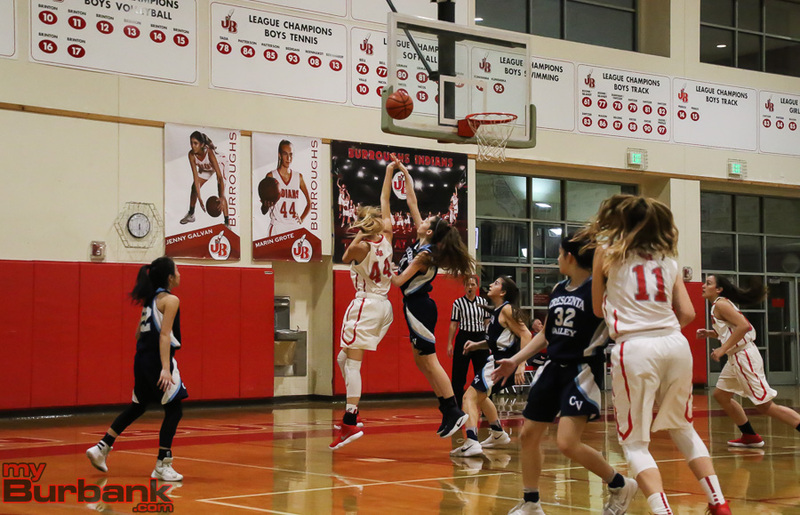 It wasn’t an artistic masterpiece, to be sure, but Friday night’s Pacific League girls’ basketball showdown between Burroughs High and visiting Crescenta Valley was gritty, at times wholly exciting and needed an overtime in order for the Falcons to secure a 54-52 decision. 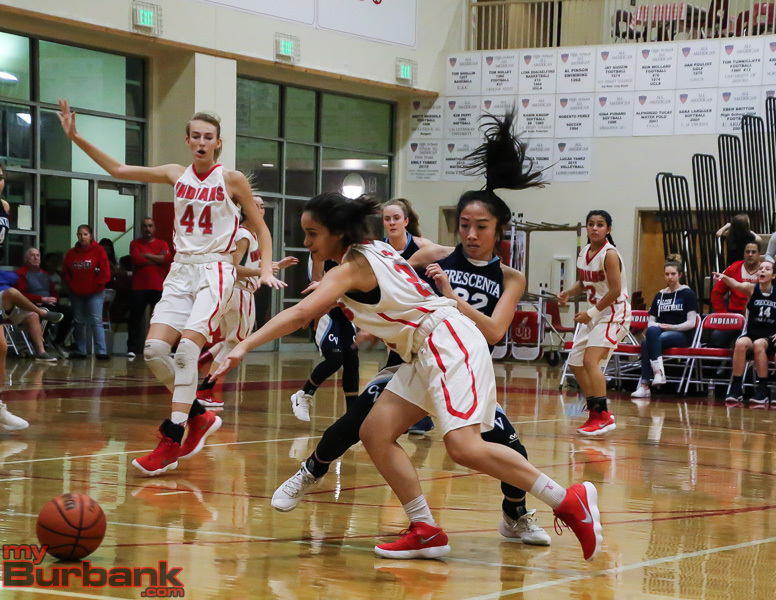 Burroughs (12-7 and 3-2 in league) pulled ahead 11-10 after the first quarter, trailed 21-20 at halftime, fell behind 32-23 through the third frame and outscored the Falcons 20-11 in the fourth period, which forced the extra session. In overtime, Crescenta Valley (14-4 and 5-0 in league) made three of five from the field and all four free throws. 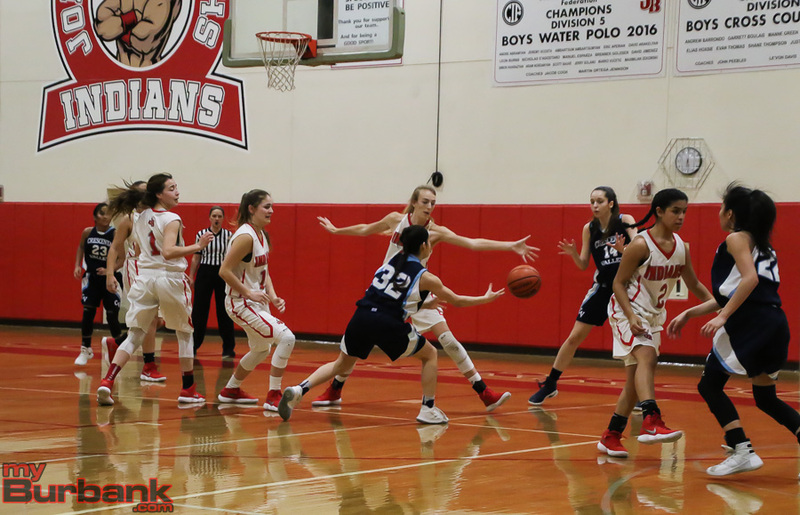 Burroughs converted three of 10 from the floor and three of six at the charity stripe, with senior center Marin Grote, who grabbed a game-best 24 rebounds, scoring six of her game-high 17 points. A hoop by freshman power forward Kayla Wrobel (13 points) from five feet and one second remaining tied it at 43-43. The pace was fast and furious when the Indians hosted the Falcons in a Pacific League matchup. (Photo by Ross A. Benson). When Grote drilled the first of two free throws, the Indians took a 40-39 lead and 1:12 left. 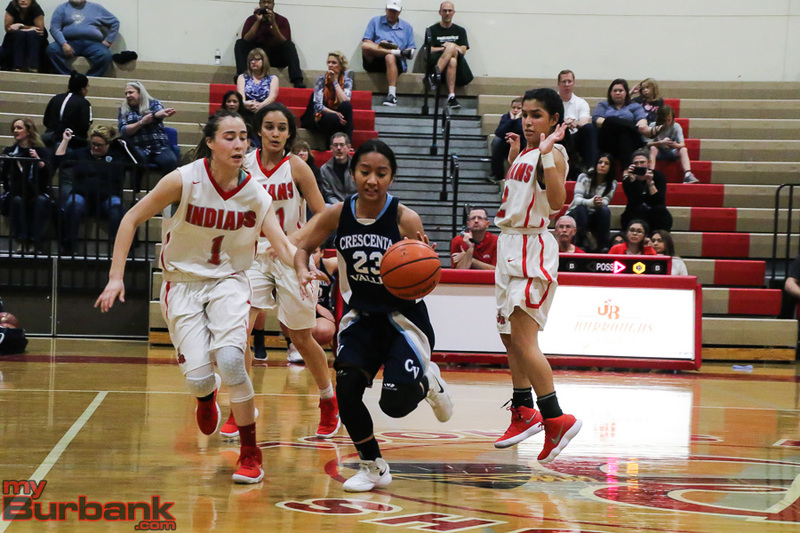 After junior point guard Ariana Farias made the second of two free throws for her only point and 16.1 seconds on the clock, the Indians pulled within 42-41. 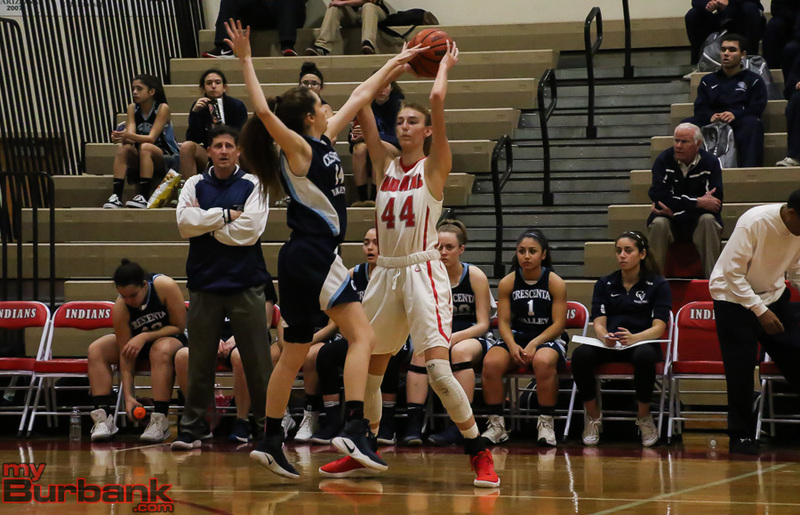 Freshman power forward Faith Boulanger hammered in three free throws during overtime and finished with 10 points, including seven points in the fourth quarter when the Indians canned six of 17 from the field and eight of 15 from the free-throw line. The Indians converted 16 of 60 shots for 26.6 percent and 20 of 40 free throws for 50 percent. Junior shooting guard Georgina Kregorian scored nine of her 11 points in the extra frame for the Falcons. Kregorian said that she was assisted by the other players. “I just couldn’t be more happy for my teammates because if it weren’t for their passes and the way that they played, I wouldn’t have played the way I played,” she said. Kregorian then added: “We were very nervous. It goes overtime. So we had to forget about the lead. It’s a new game. Our mind-set was just to win,” she said. The Falcons, who drilled 19 of 60 for 31.6 percent and 12 of 19 (63.1 percent) from the charity line, were paced by senior point guard Sarah Perez’s 13 points. Senior power forward Michelle Boghossian added 12 points, including 10 points coming in the opening half when the Falcons made eight of 29 from the field (42.1 percent) and five of six from the free-throw stripe. The Falcons tied it at 16-16 with 3:31 left in the second period on a bucket by Boghossian. Burroughs came out in the second half and missed its first three shots before Wrobel scored, but what followed was 10 consecutive misses and a three-point quarter. The Indians made six of 19 at the intermission for 31.5 percent and seven of 31 in the second half for 22.5 percent, excluding the overtime. The Falcons drilled four of 14 from the field in the third quarter as senior shooting guard Arlene Ovanessian scored all of her six points and senior point guard Rachel Dayag (six points) hitting a trey early in the period that gave Crescenta Valley a 24-20 lead. 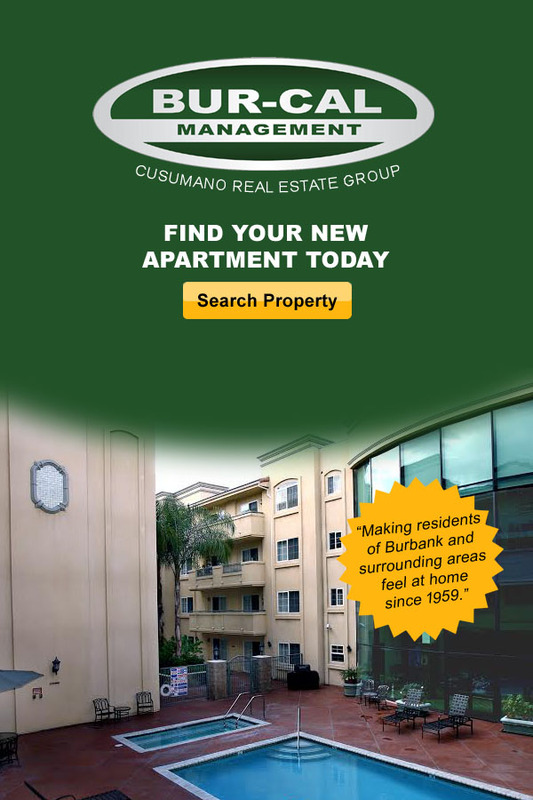 This entry was posted in Girls Basketball, Sports and tagged Ariana Farias, Burroughs High, Faith Boulanger, girls basketball, Kayla Wrobel, Marin Grote, Pacific League on January 13, 2018 by Rick Assad.